I teamed up with Red Ridge Farms – an Oregon Vineyard, olive oil press, and garden nursery – for a wine dinner event. We served a five course meal inspired by street food using Red Ridge Farms’ locally grown and pressed olive oils with wine pairings from Red Ridge’s wine label, Durant Vineyards. I always enjoy developing a menu, especially a tasting menu and especially tasting menus paired with wine (or beer or cocktails). While I had fun writing all the recipes, my time as a pastry chef makes me particularly partial to desserts. 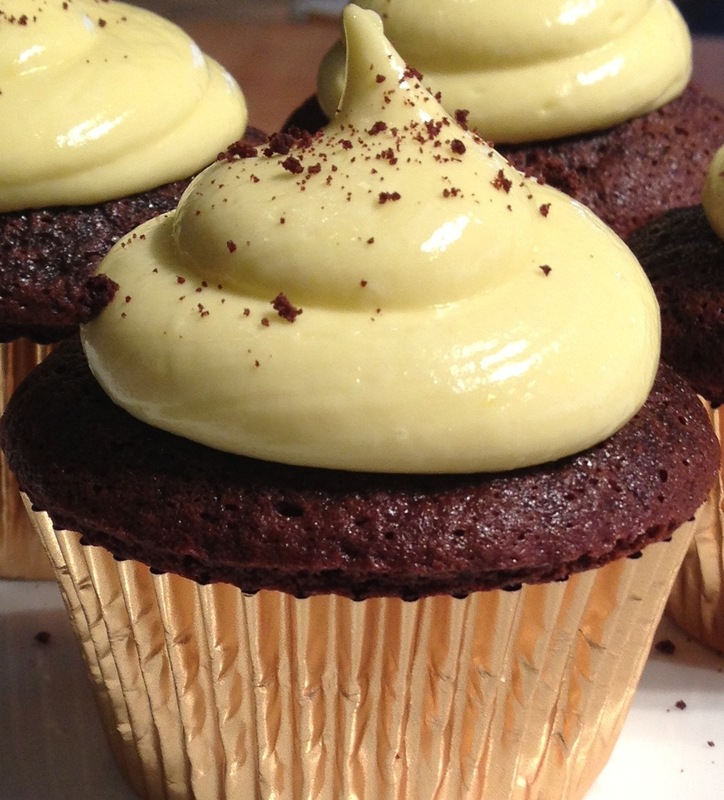 Therefore, we are going to focus on our sweet selection, the Malted Devils Food Cupcakes with Passion Fruit Cream Filling and Olive Oil Buttercream – and some of the science behind its chocolatey decadence. About every six months for at least the last 8 years I have read about the “cupcake trend”. I have started wondering how long something has to be popular before it is no longer a trend and simply awesome all the time. Cupcakes are so consistently trendy that there is a trend of things being the “new cupcake”. Can you remember a time when people didn’t want cupcakes? It seems to me that the upsurge in things like cupcake shops has more to do with the growing interest in artisan food than some people suddenly realizing how delicious moist cakes with mounds of frosting can be. The first thing to remember is that cupcakes are cake. A cupcake recipe is just a cake recipe and visa versa. This may seem obvious, but I have caused confusion on any number of occasions by handing out a regular old cake recipe when asked for a cupcake recipe. Though food historians are woefully at odds about the actual origins of the cupcake, there is no argument over the fact they are, in fact, simply cake. We are making devil’s food cupcakes, which follows almost exactly the same process as most cake recipes. In any cake recipe, we are going to start by beating together our sugar and our fats – typically butter or oil. Butter gives you a moist cake. Oil recipes gives you a tender1 cake. You will see the occasional recipe that asks for shortening. Do not trust this recipe! Do not lend them money. Do not let them take your daughter out for a late night drive. Definitely do not cook and eat them. Because of its melting point, shortening gives you a greasy cake, simultaneously making the cupcake neither moist nor tender. For more on the difference in fats, see my Pumpkin Pie recipe and post. Once the fats and sugars are beaten together, we add eggs and any flavoring (i.e. vanilla, etc.). The eggs are helping us in a couple of ways. First, they emulsify the mixture. Egg yolks contain the lipoprotein lecithin, which helps bond together fats and liquids. We have plenty of fat and a bit of liquid in these cupcakes for the eggs to hold together in a nice, uniform mix. Second, the eggs are also going to build structure. When eggs get hot, they get firm. This is from the coagulation of the proteins, which is going to help make sure that our cupcakes hold their shape. Fats and sugars are tenderizers, meaning they breakdown structure. We need structure to hold the cake together and trap air for rise. We need tenderness to make that cake dissolve in your mouth. The ideal cake is a deft balance of these two requirements. Once the eggs are well incorporated, we add the dry ingredients – flour, cocoa powder, malt powder, salt, baking powder, and baking soda. We are going to focus on the cocoa powder and baking soda, but all these ingredients are important and doing something sciencey in the recipe. Most baked good that contain cocoa powder will also contain baking soda due to the way they react together. Baking soda is a base that releases carbon dioxide when mixed with an acid, such as vinegar. This reaction can create the eruption of a kitchen volcano, bubbles in soda water, and rise in baked good. Some recipes, like most red velvet cakes, actually use vinegar to react with the baking soda. 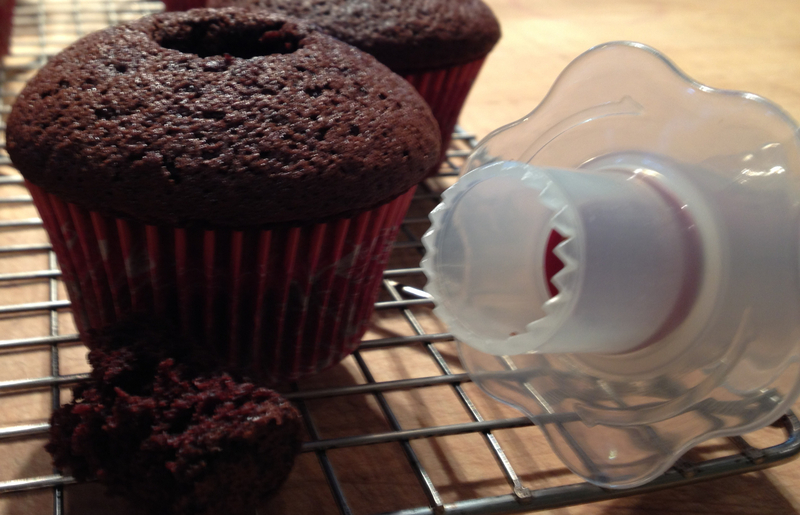 For devil’s food cupcakes, however, we don’t need vinegar because cocoa powder is acidic (the exception is Dutch processed or Dutched cocoa powder). The cocoa powder acids will also damage the glutens in the all-purpose flour2. Without the acids in the cocoa, we will have dense, tough cupcakes. The recipe does not tell you to sift the dry ingredients together. Sifting is supposed to aerate and mix ingredients. In theory, this is true. In practice, I have never found that it makes a lick of difference. The only time I would insist on sifting is if you are making a cake lightened with meringue (eg, angel food cake). Last step, we bring the milk and water to a boil, then slowly stream it into the mix while the mixer is running. We heat the liquids for the texture of the cake. The hot liquid gelatinizes some of the starches in the flour and cocoa. The starches absorb water, swell, and become viscous. This creates the signature thick, rich, almost gooey consistency of devil’s food. Distribute the mix, place it in the oven, bake and we’ve got cupcakes. Now it is time to prepare the elements that are going that will make these cupcakes show stoppers. It is not a secret that chocolate and orange taste great together. What many people don’t know is that it is not just oranges, but the whole array of citrus and, for that matter, sour things. The richness chocolate and the sharp, cleansing quality of sour flavors balance each other beautifully. For our cupcakes, we are going to use passion fruit, which has a delicious, citrusy flavor. For the less adventurous or those who can’t find passion fruit or passion fruit purée locally, lemon curd is a good replacement for this filling. We are making a creme patisserie, which is the fancy French way of saying pastry cream, which is the fancy chef way of saying pudding. Don’t think of this as the same pudding you get in a snack pack and don’t even consider replacing this filling with instant pudding or I shall banish thee from the land. Pastry cream, as the name suggests, is used throughout the world of pastry in everything from eclairs to cream pies. Pastry cream is not creamy, rich, and delicious, it is also versatile and resilient. Pastry cream is a uniquely heat-resistant custard due to its starches and can be thawed its original consistency after months in the freezer. 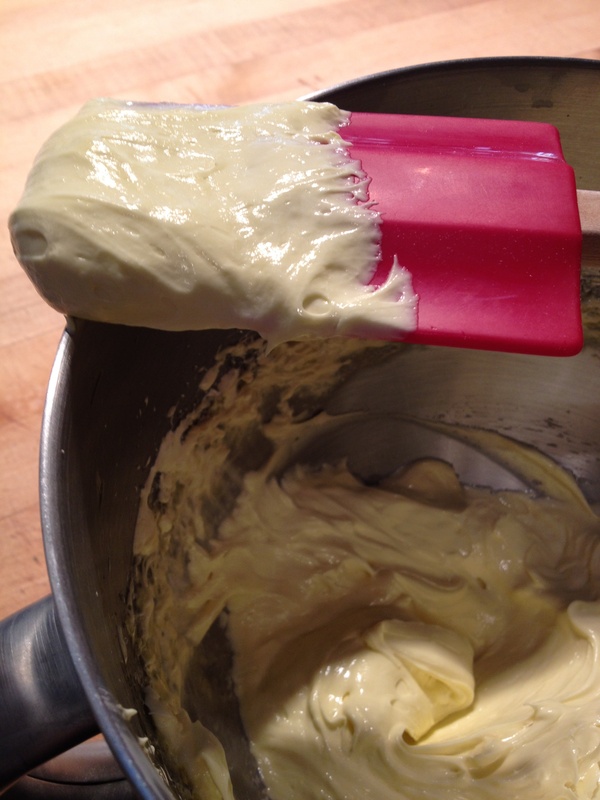 To make our pastry cream we start by simply whisking together egg yolks, sugar, and cornstarch. We then whisk in our liquids, cream and passion fruit purée3. I whisk everything right in the pot I will be cooking in so I have one less bowl to clean later. Most recipes for pastry cream will tell you to warm the milk first with idea that you are tempering the eggs. Once again, true in theory and unnecessary in practice. Just get it mixed, on the stove, and start cooking. We need to whisk our pastry cream constantly as it cooks to make sure we don’t get lumps. It is going to look like nothing is happening for a while and then – wham – just before it reaches a boil, it will start thickening until it looks like pudding. That’s it. Done.Transfer the pastry cream to a container, press plastic wrap directly onto the surface to prevent that skin pudding loves to form, and put it in the fridge. Why did the pastry cream turn thick all of a sudden? Our old friend gelatinization. And a bit of coagulation as well, I suppose. The starches in the cornstarch swell, absorb water, and thicken as they heat making it harder for the molecules to move past each other and making the mixture viscous. The longer carbohydrate molecules also interfere with the egg yolk coagulation. So, while the egg yolk proteins will be able to help thicken the pastry cream by coming together slightly, they will not curdle. We are going to make a French buttercream frosting. There are several different butter creams that are used in cake making and decorating. Italian is made with Italian meringue. Swiss is made with Swiss meringue. American is basically butter and powdered sugar. 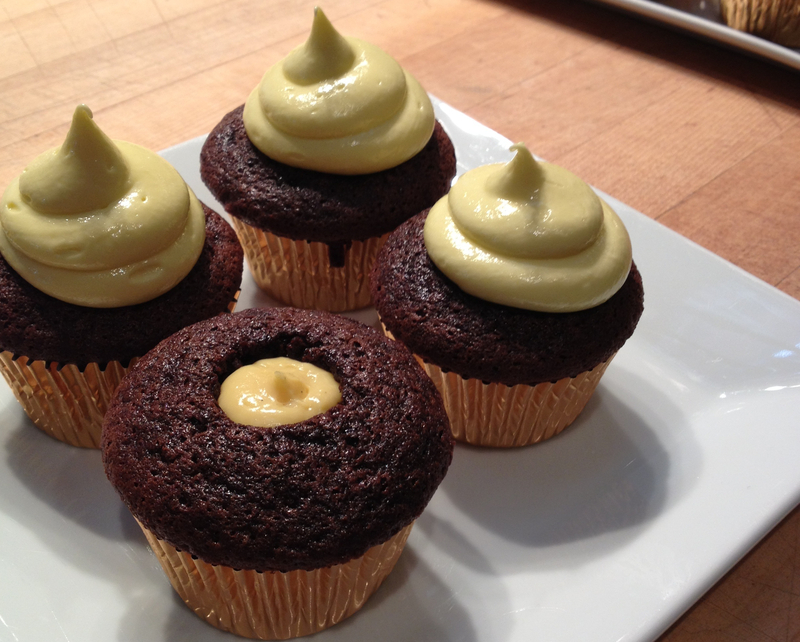 Our olive oil buttercream needs French buttercream’s unique ingredient: egg yolks. For a French buttercream there are essentially three elements: egg yolks, sugar syrup, and fat. Usually the fat is butter. In our buttercream, we are replacing a small amount of the butter with olive oil for flavor. Be sure to use a good, flavorful olive oil since we are not using much of it. The sugar syrup is a mixture of sugar and water cooked to exactly 240 degrees Fahrenheit (115.5C). At 240F, sugar reaches the soft ball stage, which means that we have cooked out enough water to allow the saccharide molecules to tangle into a soft, pliable sugar when cooled (think soft, chewy caramels). When we whip this into the yolks, the syrup will slowly cool and trap air in its gradually thickening network causing the mixture to be lighter. The real key to this particular buttercream thought is the egg yolks. Since we are adding a liquid fat (olive oil), we need to ensure that it will incorporate smoothly into the rest of the mix. Solid butter is already in an emulsified state. So, we don’t have to worry about it. Once again, the lecithin in the yolks helps combine the oils with the liquids. We’ll start by adding about half the butter first. This will create an emulsified base, which will make it easier for the oil emulsify itself. We then slowly drizzle in the oil while the mixer is running. Our mixture should look a bit like mayonnaise once all the oil is added, because what we have here is not extremely different in structure than mayonnaise. Add the rest of the butter and we’re there. Now we just have to put everything together. Simply take the core out of the cupcakes (a small round cutter works well for this or they do make actually cupcake corers for this exact type of thing), fill it back in with the passion fruit filling, pipe the frosting over top, and enjoy. Yet again, science makes life more delicious. Happy sciencing and happy cooking! 1. “Tender” in baking refers to a lack of structure. Shortbread cookies are tender because they fall apart easily. Breads tend not to be considered tender by bakers no matter how soft they are, because they don’t fall apart. 2. Most cakes are made with cake flour, whose gluten has not only already been damaged, but there is less of it. This gives softer, more cakey results. Cakes made with cocoa powder are often made with all-purpose flour, because the cocoa powder will damage the gluten for us. 3. You can make pretty much any flavor of pastry cream or pudding by simply changing what liquids are added as long as you maintain the ratio of liquids to starches. Most any fruit purée and be substituted or simply use all milk and add flavorings. For chocolate, just add chopped chocolate at the end of the cooking process and whisk until melted. This entry was posted in From the Kitchen and tagged Baking, buttercream, cake, cupcake, devil's food, food science, olive oil, passion fruit, pastry cream. Bookmark the permalink.